"Our time is limited. We forget that." 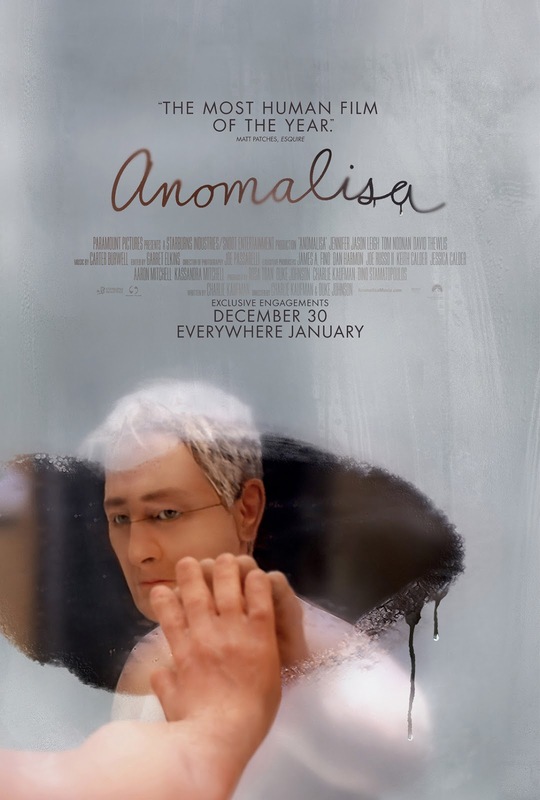 That is a very inspirational quote from David Thewlis in Anomalisa, which is not only one of the year's best films, but also one of the best animated films of all time, in my opinion. The film is based on the play by the film's writer/producer/director, Charlie Kaufman. Set in 2005, Thewlis plays Michael Stone, a self-help author, best known for his book, "How May I Help You Help Them? ", which he is going to promote at a convention for customer service reps in Cincinnati. Michael has been emotionally distant from everyone so much to the point that he hears everyone with the same voice (all voiced by Tom Noonan). After having a drink at a bar with an old ex-girlfriend, he goes back to his room, & takes a shower. After he gets out of the shower, he hears a distinct female voice. The source of the voice is a young woman named Lisa Hesselman (played by Jennifer Jason Leigh). She is very insecure about herself, claiming she isn't smart or pretty. After drinking at the bar, they go up to Michael's room, where they both realize that they have such great feelings for each other, & they now become very intimate with each other, now realizing that they are who they had been looking for all along. The film is an animation masterpiece. Thewlis, Leigh & Noonan are all excellent, providing some of the best voice acting I've ever seen. The direction from Charlie Kaufman & Duke Johnson is excellent. The screenplay from Kaufman is excellent, & just as good as his screenplays for 1999's Being John Malkovich, 2002's Adaptation, & 2004's Eternal Sunshine of the Spotless Mind. Overall, this is one of the year's best films, one of the best animated films of all time, & the greatest film involving the human emotion in a while.